The run was done last week 9th October 2011. This was a self organize run with no registration fees, no support, self own transport from start to finish venue and most of all this was just for ‘FUN’. The reason why I organized this run was not because of the distance ( which was around 28km) but because of the geographical locations. The run was from point A to point B and I’m sure not many have ran from Muara to Bandar Seri Begawan using the old road. The challenging part is the logistical/ transportation. Since this is a self service run, so it is every runner responsibilities to provide their own transportation at starting and finish area. At first my plan was only to run with my team but when a few people shows some interest in the run when I put in my Facebook status, so I created an event for it. The run was supposed to start at 6:30am but I changed it to 5:45am since a few runners advice me it will be hot if I start at 6:30am. As expected, nobody showed up except for my team and for me I wasn’t that disappointed of the low turn out. Transportation problem I guess. The 1st checkpoint was somewhere in Salambigar near the pos office which was 13km from Muara. We managed to maintain the pace around 5:45 to 6:00min/km. Usually at every checkpoint we rest from 5 to 10 minutes and altogether there were 4 checkpoints. Salambigar, Old Tiong Hin, Padang Kebajikan and Jabatan Bandaran. The run started to get very hard after Padang Kebajikan checkpoints which was around 21km mark. The longer the rest, the harder to start running again. We managed to reach the finishing point which was Ayamku Restaurant BSB less than 3:30 with total distance covered around 28km. Resting behind Taman SOAS. That cooler box is filled with cold water and I put my feet inside to cool it. It was so cold that I can only ‘tahan’ around 10 seconds and pull it out. I did it a few times and it did really help with the quick recovery of my feet and ankle. Next time I wanna try to dip into a waist high cold water to quicken the recovery of my leg. I’ve participated numerous run in Kota Kinabalu, Kuala Lumpur, Singapore and Hongkong and the distance ranging from 21km to 84km. I’ve come to realized that I have been participating and competing in other countries running longer distance but not in Brunei. 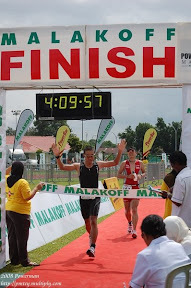 But the problem here in Brunei, there are seldom long distance events (zero marathon event). The most event would be a 10km run. If I wait for it, it would be a looooong wait, so just create your own ULTRA long run. Next project would be HuaHo Manggis 2 HuaHo Tutong Ultra Run 50Km +++ and probably I would do it as early as end of November or as late as end of December. That would take around 6 to 8 hours because I’m doing it for ‘FUN’ not for time. Start time would be after Subuh prayer around 5am and 1st water checkpoint would be at Bukit Shahbandar which is 22km mark and after that most probably every 2 or 3km mark. After that would be KB to Bandar Ultra RUN which is around 140km+++. The plan would be to start on Saturday afternoon after Asar prayer probably around 4pm at KB Clock tower and reached Seria Mosque just in time for Magrib prayer. After that continue on running/walking with lots of checkpoints and expected to reached home at Sg Akar after 15 to 20 hours on the road. AND this is going to happen NEXT YEAR 2012. Still need more planning. Thank you for the comment. The main objective of the run was to run from muara to bsb not the distance and everyone was well inform of this. Maybe next time i'll do start n finish run at the same place. fantastic! keep up the self-supported long-distance runs. Brunei definitely needs them. I thought we had a marathon in the past. yes, Brunei did have a marathon back in 2005/2006 and that was the last of it. Hey, keep up the great website. Good to know Brunei has a thriving community of runners and I like to follow things back home. I'll be back in Brunei in December. Are there any upcoming races then?